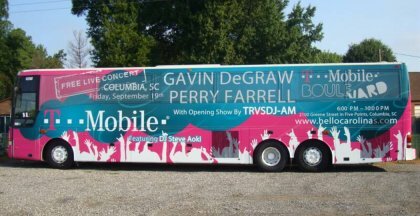 Bus wraps are the biggest billboard you can make on a moving vehicle. Buses and Recreational vehicles make a great wrap medium because of the large amount of flat surface area that is present. Our staff has experience wrapping everything from school buses to large trailers owned by a State Park. We like to survey these vehicles with an in-depth proof form that will have us move around template elements or add things like doors and windows to match your exact make and model. Buses and trailers require precise measurements because of things like vents, posts and door handles. We like to keep our main graphical elements off of these pieces for a clear picture and an easier install. The main industries that use these types of wraps are hospitals (think blood bank mobiles), schools and the entertainment industry. We've even seen a bus or two wrapped to promote a single movie! The beauty of these wraps is that the vinyl can be safely removed for resale or just a different wrap very easily. "Unwrapping" a vehicle can be done in a fraction of the time that it takes to wrap it as long as the right tools are used. As we've mentioned before, retaining the resale value of these vehicles is extremely important. Bus wraps will not hurt your vehicle, in fact, they can actually protect the paint underneath from minor exposure and UV damage. The wrap takes the brunt of the abuse that happens to your vehicle every day. 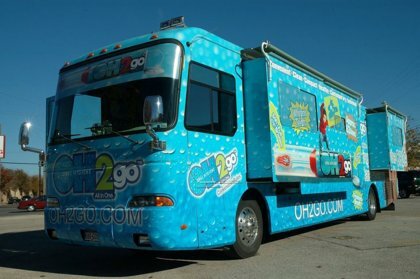 Wrapping a bus can be a significant time and money investment but the payoff can be huge. Everyone will see and remember your large billboard parked or on the road.